Township administrative offices are located at 1176 Old York Road, Abington, PA 19001; phone: 267-536-1000. Abington Township is one of Montgomery County's oldest communities dating back to before 1700; however, the official date for the incorporation of the township is 1704. Abington is home to some of the county's oldest transportation routes, industries and churches. Many of these older business and transportation centers were the forerunners of modern Abington. Today, Abington Township is a highly desirable residential area that contains a major shopping center, many small businesses, and a few of Montgomery County's largest employers. 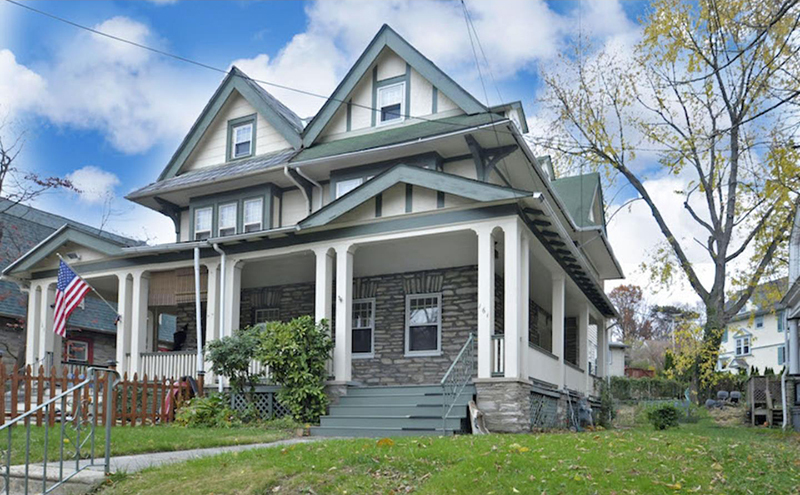 Communities within the township include Willow Grove, Roslyn, Glenside, Rydal, North Hills, and Meadowbrook. Keswick Theatre (circa 1928, 291 Keswick Ave, Glenside 19038) was listed on the National Register of Historic Places in 1983. Text below is excerpted from a copy of the original nomination document. Both in its construction and the finely wrought detail of its interior decoration, the Keswick Theater is an excellent example of American craftsmanship at its best. The Keswick is architecturally significant because it is the only theater designed by a nationally renowned architect, Horace Trumbauer. Trumbauer, who lived only a few miles from the Keswick Theater, designed many of Montgomery County's most architecturally imposing mansions, including the Stotesbury Mansion, Gray Towers (on the campus of Beaver College) and the Elkins Estate. Trumbauer was also the architect of Philadelphia's Benjamin Franklin Hotel, The Free Library of Philadelphia, and the Philadelphia Art Museum as well as one of the principal architects of Philadelphia's Benjamin Franklin Parkway. Among his other numerous architectural contributions are the Widener Memorial Library at Harvard and the entire campus of Duke University. Built in 1928 at a cost of $500,000 as a vaudeville and movie house, the Keswick is one of the Philadelphia area's last surviving theaters of the era. It is a late and excellent example of the classic Adam's style application to theater architecture. Today, few of the country's Adam-inspired theaters survive. With the demolition of Philadelphia's Fox Theater, the Keswick will be the last such theater in the Philadelphia area. The Keswick Theater's social significance stems from its having been a unique neighborhood theater which has played an unusually important role in its community development. Serving an area that anthropologist Margaret Mead has described as "an atypical American Suburb" (because of the way it maintained its own distinct identity as a cosmopolitan community with a small town flavor), the Keswick Theater was originally conceived by its first owner, Edwin N. Johnson, as a cornerstone of his plan to make the Greater Glenside area the cultural and commercial hub of Lower Montgomery County. To promote both the Keswick Theater and the community, Johnson, the principal developer of the Greater Glenside area, created the "Glenside Gazette," a monthly journal which became the first newspaper ever published by a theater in the Philadelphia area. During its 52 year history, the Keswick Theater has served the community as a gathering place and an instrument of charity. Upon the theater's opening, one of Edwin Johnson's first acts was "to give the Glenside Kiwanis Club the use of the theater for two evenings to conduct a benefit for under privileged children." This was the first of many occasions when the theater's facilities were offered for charitable purposes. In 1970, the theater was unofficially dubbed "St. Keswick's" when Sunday masses were held in its auditorium during construction of a nearby church. The Keswick was both a legitimate and film theater, with its own orchestra under the direction of John A. Brall (formerly of Keith's Chestnut Street Theater in Philadelphia). Among the stars who appeared prior to its conversion to a straight film policy were the Marx Brothers, Mae West, Stepin Fetchit and Fanny Brice. Both the famous and less renowned vaudeville troupers who played the Keswick during the late 1920s and early 1930s stayed at the nearby Casa Conti (listed on the National Register as the Casa Conti/Weldon Hotel.) As a film theater, the Keswick's history encompasses almost the entire range of the American moviegoing experience. During the late 1920s, a night at the Keswick was a gala event which often combined a stage show, an orchestral program, and a film. The theater has weathered Edward Johnson's policy of racial segregation (an unfortunately common practice among theater owners at that time.) For several generations of Montgomery County residents, the children's matinee at the Keswick was a neighborhood institution.